My mom bought one of these teacup Maltese dogs about 7 years ago. She turned out to have numerous ear infections and is now deaf. Can't even hear a dog whistle. She also has skin issues. Her skin will become red and inflamed every other week, the vet considers it to be "dog eczema" and a reoccurring yeast infection of the skin. It is very sad to watch her come to a dead stop from playing and dig deep at her skin. Not to mention the thousands of dollars my parents have spent at the vet on visits and her prescriptions. All of this before this so called teacup Maltese was 5 years old. 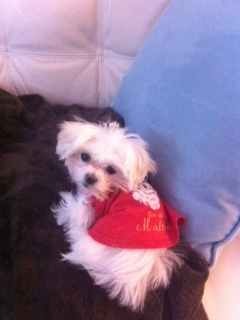 All the traits you mentioned above were present in my teacup Maltese named Red. He is a dear favorite pet to our family and we loved him like a baby especially that he is a homegrown coming from my other pure breed Maltese. But after two years of making us happy he passed away due to genetics - liver and kidney problems, according to our veterinary. His memories will remain with us always because of the love and happiness he too shared with us. Thank you. 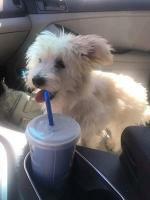 Gracie is a 15 week old teacup Maltese and is 1 lb. 1 1/2 ounces of energy. She is my third Maltese and the smallest. I did not plan to get such a small little girl, my breeder is retiring and she is related to my other little girl, Lily, so I decided to get her. (Their dad's are grandfather and grandson.) I am nervous about Gracie being so small but she is so healthy and has an awesome appetite. Her best friend is my daughters 12 lb. little boy, Olliver. Ollie is a rescue dog who is part pek/yorkie/maltese. Gracie also loves my little boy, Topher, who is a 6 lb. Maltese, but her heart is with Oliver. She plays rough and somehow the other babies put up with her! I have to be careful with what she is allowed to get up on and she has to be supervised since she wants to climb on everything. As much as I love her, I would not recommend anyone having a teacup Maltese this small if there are any children involved. As spunky as she is, she could be hurt easily. I'm so glad to hear that you like me , love these babies so much, mine has not gotten home yet but I don't care if she grows to be a big girl. My sister is a lover too and hers is tiny , so when I purchased Brianna I thought I was getting a small one also, then I realized , after paying for her and speaking to the breeder that she was not what I had hoped for , but she send me the pictures and it was love at first sight, I'm more estatic than my 10 year old daughter , who Brianna was adopted for. Love the pics of your baby, post more. There is no such thing as a teacup Maltese. These poor little Maltese are bred to be tiny so unscrupulous backyard breeders can name them something cutesy - like "teacup" and scam unsuspecting buyers out of more money. 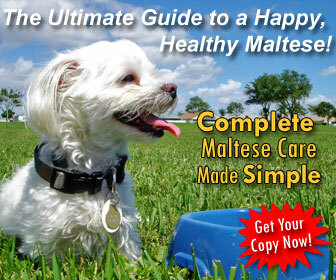 They are bred on purpose to be small and tiny - as if the Maltese isn't small enough already. They come with health issues because of this breeding practice. They are easily hurt jumping off furniture or playing with small children. I know, I know - your "teacup" never has been hurt. Let me know when you get that $2000 vet bill because it will get get hurt eventually. 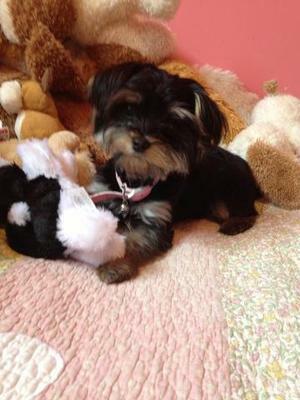 Check the AKC - so such thing as teacup or toy. 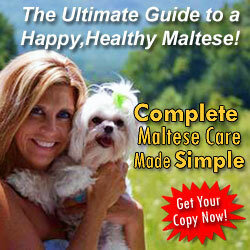 Maltese are part of the toy group already and should not be bred to be smaller than they already are. Jo, I'm also from Minnesota which has nothing to do with your subject or my reply except are we the only ones to really realize this? I have said it and written it so many times I can't count. 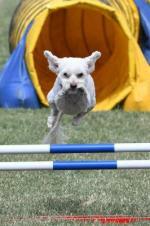 There are no teacup Maltese or any other kind of dog. they are as Jo said from Backyard breeders mostly trying to make extra bucks selling something that should not be. These tiny dogs are to tiny for their little body to function the way it's suppose to. They have major health issues and do not live a long happy normal life. Please don't support these breeders by buying these tiny babies. If there is no market for them then they won't breed them. My 2 Maltese are 7 pounds and totally happy and spoiled rotten and I wouldn't have them any other way. Mya is 8 months old and weighs 2.5lbs. She is a teacup Morkie (Maltese Yorkie mix).... she is very loving and always wants to sit on your lap, but she is also very territorial. She has been very difficult to housebreak, and still isn't completely housebroken at 8 months. She is fragile, but she loves to rough play with our 4 year old Morkie who is much bigger. She also loves to play with our three girls, and even lets them dress her in doll's clothes.